Continual Learning – Why CPD is important to the geosynthetic industry? Over time, new research allows practitioners to better understand the limits and push the boundaries of geosynthetics to solve real-world engineering problems. As a result, design and test standards need to be updated and reflect the state of the art in design practices for the benefit of owners, practitioners and the general community. At Global Synthetics we strive for continued excellence by providing quality designs using quality products. In addition to this we are committed to providing continuing professional development (CPD) opportunities and access to the latest research and findings by our industry’s pioneers. 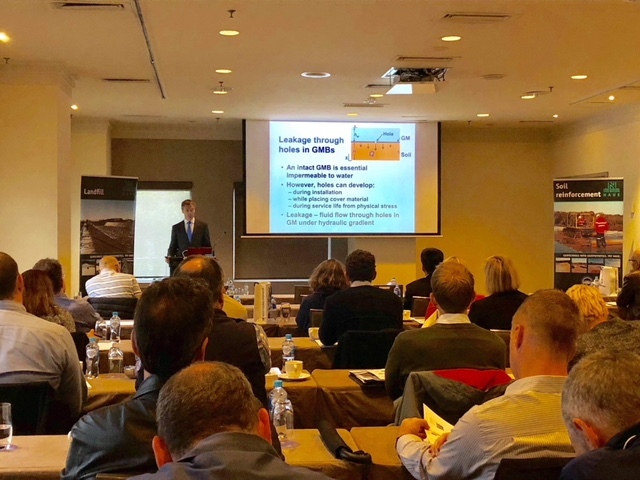 We believe we can achieve one of our goals by holding important annual seminars such as our recently held Landfill Seminar: Advances in Landfill Design & Specification. In these particular seminars we learned from Professor Richard Brachman from Queen’s University that Polymer Modified Bentonites (PMB) in GCLs may provide short-term benefits with respect to Downslope Erosion in landfill applications, but in the long-term, they still exhibit extreme irrecoverable downslope erosion. The only solution besides using 300mm soil cover immediately after placement of the GCL (uncoated), is to use a Coated GCL to prevent Downslope Erosion. Furthermore, Polymer Modified Bentonites (PMB) in GCLs are detrimental to slope stability due to extrusion of the hydrogel and causing lubrication of the interface surface. It also reduces the peak and residual interface shear strength and friction angle. The commercial manufacture and exact distribution of PMB GCLs is extremely difficult to quantify and to provide Quality Control in the factory and in the field. The performance of PMB GCLs is highly sensitive to the Polymer Loading/Distribution in the GCL. In addition, elution of the polymer in PMB GCLs has also been proven and should be considered in its long term performance in landfill applications (Gardam et al., 2014). The dried mass per unit area of a GCL may also include the presence of polymers or other additives. If in doubt, consult the GCL manufacturer for exact product details. What we have presented here are just the findings from our latest seminar series to learn more about past or future events please feel free to contact us.